We propose three design concepts: First, "law and nature", which is to take the law out of nature. 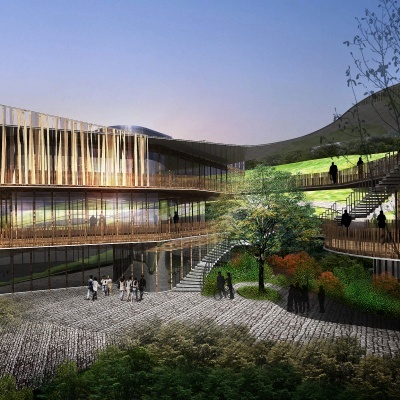 Since the base is located amidst the mountains and forests facing the south, we hope to introduce local natural elements such as mountain ranges, forests, sunlight, clouds and fog into the design to create a spatial feeling that blends the inside and outside the building. The second concept is "no complications". Starting from the perspective of "law and nature", the building should be in simple and pure lines, and therefore the philosophy of "subtraction" is adopted to remove unnecessary decorations so that that building returns to nature and the life and interaction among people. The third concept is "non-action", using local mountain rocks and raw materials for the building and its space, such as rough stones and wooden lattices. The simple and unadorned concrete surface brings the texture of the building back to primitive simplicity. We use these ideas and techniques derived from the nature to shape a space atmosphere that emanates aura and echoes the surrounding forests, and provide a space for the contemporary society where people can sink into their spirit, learn from the nature and share life with others.